Every writer works differently when it comes to making a note of ideas, then building them up, making them bigger, better and faster until they either run straight into a brick wall or zoom all the way to victory. I've developed a personal approach over the last year or so, as iOS technology has increasingly dovetailed with my working life (thanks, Steve Jobs, and RIP). Initial ideas, whether I'm at home or out and about, get tapped into the Evernote app on the iPhone, where they are then synced across the ether, ready to be examined on the PC at a later stage. I used to do this in a physical notebook, but I find that it's all too easy for scribbled ideas to become lost among those pages. With something like Evernote, you can organise ideas into different notebooks ('Doctor Who ideas', 'short story ideas', 'feature ideas', etc) and easily assess them all in one place when you're looking for something to work up, or an idea to cannibalise. Yes, £6.99 seems quite expensive for an app. And it is, when compared to the other two apps I'm talking about here. Pages does have the cachet of being the iOS version of the desktop-hugging Pages For Mac. More relevant to its defence, is the fact that it technically packs in enough features to justify the price. Of course, it depends how many of them you're planning to use. There are templates all over the place, for writing letters, etc, plus all manner of customisable elements, but I've only ever wanted to open a blank page and write. Pages also offers good value for money if you have an iPad and an iPhone, as you can use the one purchase on both. Pages presents a simple enough interface, although one thing really bugs me: I constantly forget how to name files. This really should be the easiest, most intuitive thing in the world, but on Pages I often find myself going around in circles until I work it out. Groundhog Day for writers. I must admit that, as much as I really like the following two apps, Pages might well be the one I'd use if I was writing quite a lot of intensive prose. So it's worth the investment for that sturdiness alone. The file-export options are pretty comprehensive, too: you can e-mail your doc, print it, share via iWork.com, send to iTunes, copy to iDisk or copy to WebDAV (whatever the hell that last one is). Import-wise, you can copy files in from iTunes, iDisk or - of course - WebDAV (from within Pages) or switch over to your trusty Dropbox app and export a file to Pages from there. Also available for: Nothing, as far as I can tell. It's specifically for iPad. This one's appeal is belied by its terrible, eminently forgettable name. Wisely look beyond that and you've got a word processor which very deliberately takes a highly minimalist approach. It's all about simple text on a white screen, with a nicely accessible keyboard, which is all you need if you don't hunger for bells and whistles. I like the way that its best features are devoted to helping you focus on what you're writing. FocusMode for instance, which lets you see one sentence at a time. There are some nice shortcuts, such 'undo' or 'redo' with a two-finger swipe. IA Writer has also tinkered with the standard iPad keyboard, including details like one single button to handle parentheses (which is nice). Connectivity isn't quite as comprehensive as Pages', but for me offers the essentials: export and import via e-mail, Dropbox and iTunes sharing. I like this one. Also available for: Nothing. An iPad special. You know, in many ways this is my favourite. While initially feeling like a novelty, it actually stands a good chance of longevity. The interface again aims for utter simplicity, but with a rather magical Zen twist. The keyboard is all floaty and gel-like, responding quite organically to your touch, like a less disturbing thing out of William Burroughs' Naked Lunch. My favourite customisable background is the snowy vista, complete with falling snow! Oh, and there's music. Relaxing, ambient music. I really enjoy one of the pieces and just stick with that on loop, but your musical mileage may vary. No wonder, though, that one of OmmWriter's slogans is "Welcome back to concentrating". I've found OmmWriter brilliantly useful when you want to sit down somewhere away from your desktop and properly focus on working out a story idea. Especially when you use headphones, it really does transport you to a realm where only words matter. Sounds good, yes? One of the two downsides is that the designers have tried to be a little too clever with their over-minimalist symbols denoting various functions. You get used to it eventually, and working it out is actually perversely fun, but once again, as with Pages, simple tasks like naming documents is harder than it should be. The other downside? 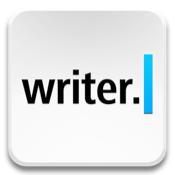 Unless I haven't figured out those symbols well enough (correct me if I'm wrong), OmmWriter has the least connectivity of all three apps here. As far as I can tell, you can't import from Dropbox. Export-wise, it's e-mail only, with a choice of txt file or PDF. This might sound grim, but it really isn't if you're using OmmWriter for story meditations and plot outlines. I've never wanted to import anything into OmmWriter. It's for creating new things. Write them on OmmWriter and send them to yourself. Simple. UPDATE DECEMBER 2012: Do bear in mind that this piece was written in October 2011. The apps above may since have developed, offering more connectivity and so on. Examine them! 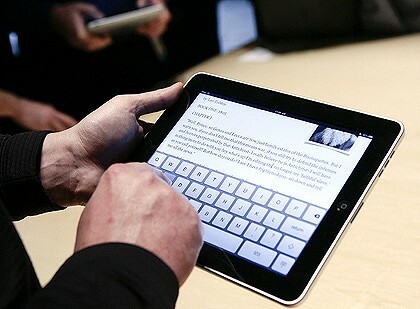 Do you have a favourite writing app for iPad? Share it with us in Comments, below. I tried Evernote briefly but for random ideas have replaced the iOS built-in Notebook app with Notesy, which stores everything in its own folder in Dropbox ready for me to pick it up on which system I'm using. Is this the beginning of the Blog Renaissance? I also enjoy using Ommwriter, but the lack of Dropbox support is an annoyance. I think my favourite is PlainText. It works with Dropbox, supports folders, works on the iPhone and is free. I found that Pages stripped out formatting quite often, so moved to QuickOffice. Which annoys me itself as the iPhone version has a word count where the iPad version doesn't... Gah. I'm a big fan of Storyist for writing on both laptop and iPad - it's basically the same app, and lets you share files via dropbox etc. It's also structured for screenwriters and novelists, so you can include your research, plot and character notes, chapters, scenes, episode structure, etc. It's much more than a simple text editor, and certainly not an app for formatting text, but for writing fiction I find it invaluable. I like to use SimpleNote or Nebulous Notes on the iPad and have the writing sync up to Scrivener on the Mac. I will be doing that for NaNoWriMo next month. Well iAWriter, Dropbox and Cymbol™ for iPad are part of my toolbox Jason with Pages, Numbers and Keynote thrown in for pulling into documents. Plus iAnnotate for PDF annotation and faster search/better file management than within iBooks native environment. Cymbol™ also has a companion, is GameGlyph for Card game notation, Chess Games, Dice and iChing for some humor measures, I guess. Dropbox though is indispensible in the mix. With iAWriter you can also go to your MacBook Air and back again after synchronization with iAWriter for Mac OS/X Snow Leopard in my case, or Lion for those with newer machines. My favourite app is Quickoffice. Yes it's (much) more expensive than the three you list, Jason, but on the iPad expense is relative. Quickoffice is a comprehensive office suite with largely intuitive controls that is entirely compatible with Word, Excel and PowerPoint, and also reads Adobe documents. Formatting is easily done, and you can create folders and sub folders quickly. It also integrates very well with Dropbox. Highly recommended.